This all-in-one, super detailed, rear end kit is a scale replica of Strange's modular rear end. 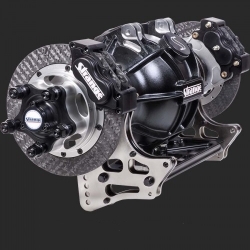 Includes rear end, rotors, calipers and 4-link brackets. This particular rear is very popular in Pro Stock and Pro Mod. Here is a photo of the real thing. Resin, printed and photo etched parts, 1/25 scale, by Futurraction.